For the second giveaway this month, Hijab Style is giving 3 winners the chance to pick a hijab pin of their choice, up to the value of £10/$15, from Jasmine Pearls Brooch Boutique. 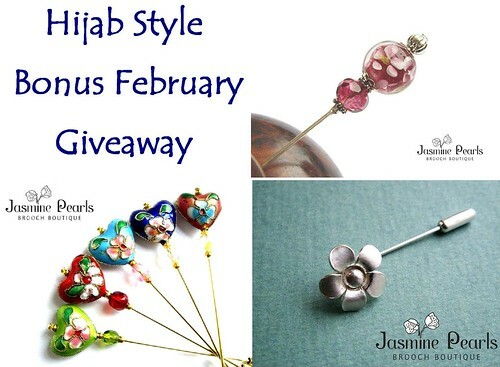 To enter, all you have to do is visit the Jasmine Pearls Etsy Store, and send an email in with the name of your favourite item, along with your full name and city with 'Bonus February Giveaway' in the subject line to hijabstyle@hotmail.co.uk. Please note that if any of this information is missing, you will not be entered into the competition. You can get an extra entry into the giveaway when you follow Hijab Style on Twitter! Simply send in a separate e-mail with your full name and link to your Twitter profile. The deadline for entries is midnight GMT on Tuesday 22nd February 2011.